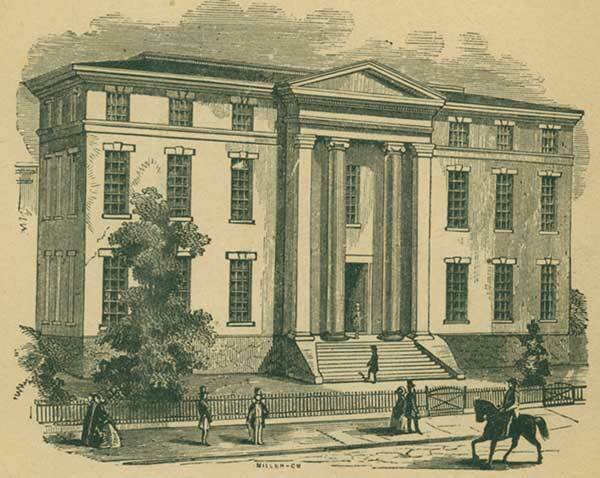 The University Libraries system traces its beginnings to 1837 and the 1,200 volumes, anatomical specimens and chemical apparatus in the library of the Louisville Medical Institute. Both the library and LMI are direct forerunners of the Sidney I. Kornhauser Health Sciences Library and the School of Medicine. First located in the City Workhouse, a dedicated location soon came with a new building at Eighth and Chestnut streets, not far from Kornhauser's current location at 501 S. Preston St.
Today, Kornhauser Health Sciences Library serves the Schools of Dentistry, Medicine, Nursing and Public Health and Information Sciences, as well as the regional medical community. The William F. Ekstrom Library, University Libraries' main and general academic library, goes back to the general library that opened at 119 W. Broadway in 1911. At that time it had only one room, housed 50 to 75 books and was in the basement of the Academic Department, which UofL opened in 1907. Medicine and law had been the school's and libraries' focus until then. UofL's acquisition of Belknap Campus in 1925 allowed the general library's first expansion. First housed in two floors of the Home Economics Building (now Ford Hall), it moved to the north wing of the new Administration Building (now Grawemeyer Hall) in 1927. Among others, Supreme Court Justice Louis D. Brandeis helped to expand the library's collection by donating books and money and by establishing special collections on such topics as railroads and the Zionist movement. In 1929, UofL adopted a central library system that is still in place. Several departmental libraries functioned as branches of the general library. Schneider Hall opened in 1956 as a dedicated library building. The library outgrew its space and moved to the new William F. Ekstrom Library building in 1981. A new wing, which opened in 2006, coupled with a robotic retrieval system, has provided even more space. Archives and Special Collections is housed in Ekstrom Library. ASC was formed in 2013 by the merger of the University Archives and Records Center with Ekstrom Library's Rare Books and Photographic Archives departments. The Music Library has been in the School of Music since that building opened in 1980. The Art Library occupies part of Schneider Hall, along with the Hite Fine Arts Institute, and the Law Library has a separate presence at the Louis D. Brandeis School of Law.